A smart electronic database for anyone in need of quick and easy access to accurate aircraft specifications. What is the wingspan of a Boeing B757-200 with retrofitted winglets? Such questions are posed daily by airport operational staff, planners, engineers and many other professionals in the aviation industry. 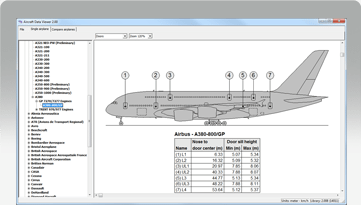 Aircraft Data Viewer provides the answer to this question and more. With an aircraft library presenting key data and graphical illustrations for more than 500 aircraft models, industry professionals need not look any further. 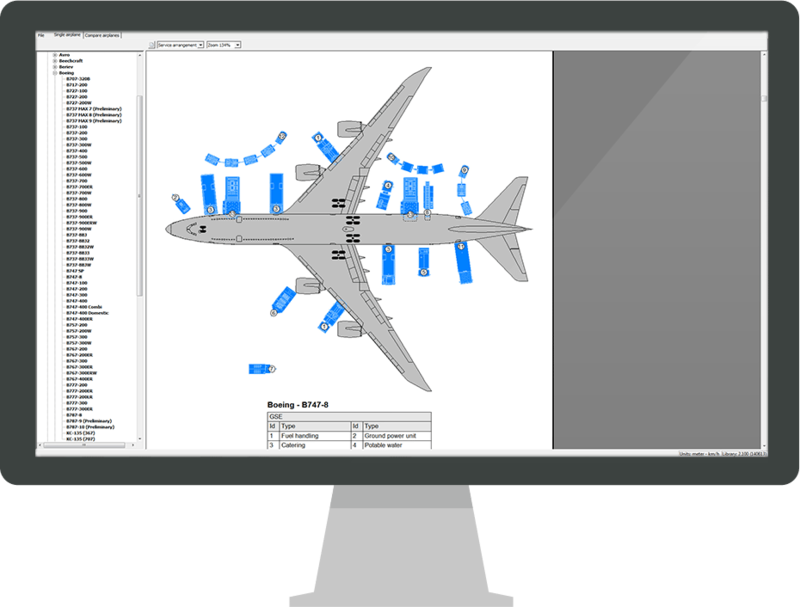 Relevant information such as aircraft dimensions, steering characteristics, door locations and jet blast impact can be viewed with ease. The location of ground service connections can also be found together with the type and position of the various aircraft service vehicles. Overview AviPLAN Turn Pro With AviPLAN Turn, simulating aircraft movements has, quite simply, never been easier. Users of all experience levels can generate turn simulations with just a few clicks of the mouse. With AviPLAN Turn, simulating aircraft movements has, quite simply, never been easier. Users of all experience levels can generate turn simulations with just a few clicks of the mouse. https://transoftsolutions.com/wp-content/uploads/2016/03/ADV_A380_Doors_big.png Overview AIRCRAFT DOOR LOCATIONS AND HEIGHTS The Doors view shows aircraft in side view with a clear indication of the passenger door locations. The exact positions measured from the nose of the aircraft and door sill heights are summarized in a table. The Doors view shows aircraft in side view with a clear indication of the passenger door locations. The exact positions measured from the nose of the aircraft and door sill heights are summarized in a table. https://transoftsolutions.com/wp-content/uploads/2016/03/ADV_A380_Maindimensions_big.png Overview AIRCRAFT MAIN DIMENSIONS The Main Dimensions view displays aircraft in top view, front view, and side view, including measurements. In a table, general information such as FAA/ICAO category is presented together with dimensions such as aircraft length, wingspan, wheelbase, engine span and more. The table also provides turning characteristics. 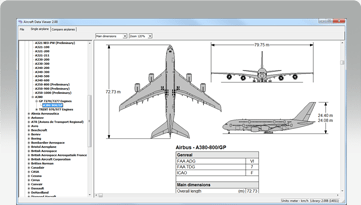 The Main Dimensions view displays aircraft in top view, front view, and side view, including measurements. In a table, general information such as FAA/ICAO category is presented together with dimensions.